Project Management Certification Training and Related Project Manager Training - Using PayPal to make your purchase. 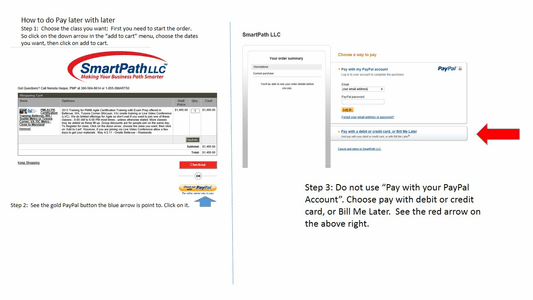 Read these instructions first if you wish to have the "Bill Me Later Option" through PayPal. (1) After clicking on the "add to cart", button you are brought to a menu that lists the class you want, then it wants you to choose your checkout. Look at the very bottom of the screen where it says Checkout (in red) or Check out with PayPal (a gold button). Click on the gold PayPal button. (2) Then on the next screen click on "Pay with a debit or credit card, or Bill me later" at the bottom of the page on the right. (3) If you are already a PayPal member click on "pay with my PayPal account" but look inside for your "Bill Me Later Option"
(4) If you are not a PayPal member yet, then click on Create a PayPal account (Bill me later is in smaller print) and continue to choose "Bill me Later"